Join us for this special service as we rejoice in our Risen Savior, Jesus Christ, which will include a special time of worship, praise, fellowship around the Lord’s Table. We will only have one service beginning at 10 in the morning. Have a grand time with a great Italian dinner and enjoy an auction that helps our young people go to summer camp at The Wilds in NC. 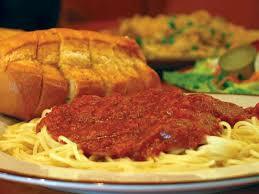 There will be a variety of different sauces for spaghetti and pasta, salad, and desert. Tickets are $7 for adults and $5 for children between ages 5 to 11. If you would like to purchase tickets in advance, feel free to email Pastor Bill. Wed Evening Study on Isaiah! The Bible study on Wed evening during the Fall and Winter is on the book of Isaiah. We will be using Warren Wiersbe’s small commentary Be Comforted. This begins @ 7 PM and a time of prayer follows. Awana Clubs (Ages 3 through Grade 6) and ProTeens (Grades 7 through 12) take place weekly on Wed night from 6:30 to 8 PM. If you would like information about Awana Clubs at FBC or would like to provide registration information, feel free to contact the Awana Secretary – Mrs. Sandy Feller via email at – Sandra Feller. If you would like information about ProTeens and the Youth Ministry of FBC, feel free to contact Pastor Bill via email at – Pastor Bill.